As recently as 30 years ago, soccer teams in the United States were primarily formed among neighborhood kids, with a local dad volunteering to serve as coach. Many of those kids would go on to play for their local high-school team, and perhaps 1-2 would wind up playing in college. Flash-forward to the present day, however, and youth soccer players have a seemingly infinite range of options, including different levels of play at almost every stage in their development, from U6 recreational leagues, all the way through to Major League Soccer. "It's a different world now," says Sounders U23 coach and general manager Darren Sawatzky, who has spent decades in Washington coaching at all levels of the developmental pyramid. 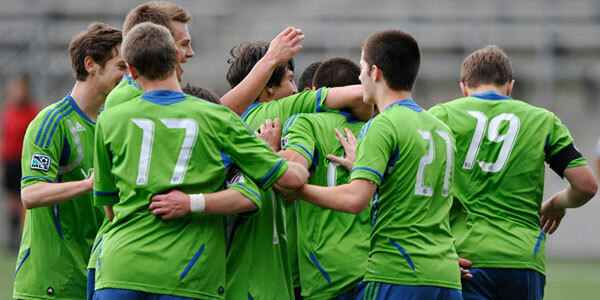 Recently, Sounders FC announced the creation of S2, a community-owned Sounders FC second team that will compete against other MLS Reserve squads in the USL-Pro, the second tier of professional soccer in the United States. Sawatzky says that the creation of S2 provides the last missing link between Washington Youth Soccer's developmental pyramid, and MLS. As Sawatzky explains, at the base of the pyramid are camps and activities that are open to anyone who wants to try soccer, mostly for the first time. From there, players progress to recreational soccer, playing in small leagues against kids from their local area, with a season that takes place almost exclusively in the fall. Players who seek an additional challenge can move up to the "select" level, which bridges the gap between the purely "for fun" recreational and more competitive premier-level teams. The best players at the premier level play on Regional Club League (RCL) teams, which is the highest level of competitive club soccer in Washington state. In addition, Washington Youth Soccer's Elite Player Development (EPD) program draws together the top players statewide to train together and compete against Olympic Player Development program teams from other states, for identification to regional and national teams. From there, the best players have two choices - go to college, or go pro. Sawatzky says that this is where the new S2 program will have its biggest impact. "Before, there might have been some kids that were good enough to ply their trade in a professional league, but maybe weren't quite ready for MLS," Sawatzky says, "so they'd go to college for a couple of years, then come out later. Now, those kids will be able to make the jump directly to USL-Pro, which if they're good enough, is no doubt the best thing for their development. It just gives them another opportunity." Sawatzky notes that for the vast majority of players that are not yet ready for professional soccer, the Sounders U23 and Sounders Women, comprised almost entirely of college players seeking games and training during their college offseasons, will continue to play a vital role. "There's so much more opportunity for kids now," he says. "When I was playing college soccer, we'd go home for the summer and call each other to get together in the backyard and play 3v3. Now, college kids are playing full, competitive games with the U23s and Sounders Women against elite-level talent all summer long." Sawatzky summarizes that the Washington Youth Soccer pyramid is designed to give every player the chance to find where they best fit, with an emphasis on providing opportunities for the most skilled players to come together to train and compete at a high level. "In order to maximize player development, you have to put the best players against other top players in meaningful competition," he says. "As Americans, we love the underdog; we love when our little neighborhood team wins the state championship. But the reality is that a lot of those teams are carried by 1-2 top players. What the developmental pyramid does is push those top 1-2 players together with the top 1-2 players from teams all over the state, and continue selecting the top 1-2 players at each level and pushing them higher and higher, which makes them better. And that's what Washington Youth Soccer does, from the lowest levels, all the way up through Major League Soccer." To learn more about Washington Youth Soccer or the different levels of play in the developmental pyramid, visit washingtonyouthsoccer.org.